Can we discuss desert island meals for a minute? If I was stranded on a desert island with a limited menu, here’s what I would have: bacon, pasta with brie and tomatoes, and chocolate chip cookies. The Southern husband would have scallops, shrimp and grits, and this very specific pork chops in milk gravy recipe. He lights up like a Christmas tree whenever he sees pork chops and milk coming out of the fridge simultaneously, and given that this is a super simple, super delicious combo of tender pork in a creamy milk sauce, who could blame the guy? So how easy IS this recipe? As easy as this: saute some flour-dusted boneless pork chops in a little butter and olive oil until they are browned on both sides. Then pour in a mixture of whole milk, flour and spices and turn the heat down and let the whole thing simmer until the pork chops are tenderly cooked through and the milk has reduced down to a thick and creamy gravy. I like to slice the pork chops into thin sections and serve the whole shebang over baby spinach, but I can tell you from experience that if you want to throw caution to the wind and add some mashed potatoes to the mix, you are pretty much smack in the middle of pork chop heaven. As for my desert island playlist? James Taylor, Sugarland and Van Morrison. And if the Southern husband is stranded with me, some Springsteen. How about you? Put flour, salt and pepper in a plastic bag and add pork chops. Shake until well-coated with flour. Melt butter in a heavy large frying pan over medium high heat. Cook pork chops until lightly browned, about 3 minutes per side. Add flour mixture from the plastic bag to 1/2 cup of the milk and stir well. Pour over the pork chops, turn heat to low and cover. Cook for 20 minutes. Turn pork chops over and add the remaining milk and the chopped thyme. Cover and cook another 20 minutes. Take cover off and cook another 15-20 minutes. If the gravy is too thick you can thin with a little more milk – if it is too thin, add a tablespoon of flour mixed with 2-3 tablespoons of milk. You can either serve the pork chops as is, or you can slice them. 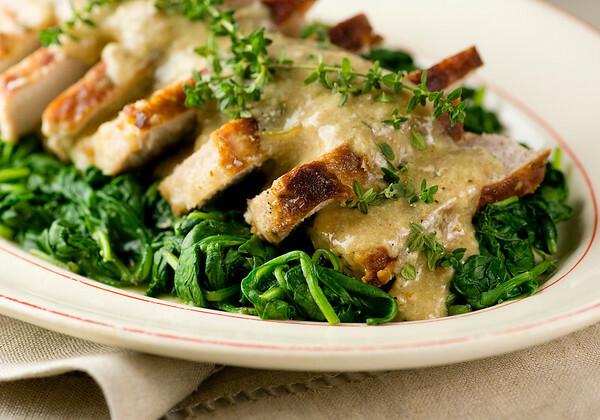 Pour gravy over the chops and serve – I like these over baby spinach, but they are also wonderful over mashed potatoes. Or both! this weeks menu! Oh… and the Playlist? I am so with you..
especially JT:-)… “You’ve got a Friend…” in CA:-)!! Wow, desert island meals. I would probably want mac and cheese. And lots of dessert. LIke, an endless buffet. If this is last meal worthy then it must be serious stuff! Ok, I’m definitely visiting your desert island. Yep, this one goes in the rotation to try! Oh, and yes please on Sugarland. Might add some Lady Antebellum in there, too. I like pork chops with bone in as I think they taste better! I’ve heard that too – will have to give that a whirl! Ah! Vince Gill’s voice makes me swoon too. Always has. And I’m a Chicago gal! I’m trying this pork chop recipe tonight! You know, being an adventurous breakfast kinda gal, I think I would do this for breakfast but make some nice grits and stir that gravy into them, top them with an egg and have a nice skinny chop on the side…and keep the spinach, too. ;) After a breakfast like that, I could definitely take on the world (after a brief nap). Hee! Desert island music??? It would have to be a comp for me. I’d can’t waste my ears on cuts that don’t grab me, but Cure, NIN, Michael Bolton (the king of the power balad), some of Robert Palmer’s more obscure stuff, Type O Negative, Chris Isaak…see why I’d need a comp? LOL! I’m all over the place. Oh, I pretty much like to start the day off with a bang. ;) Wake up those tastebuds and give them something to stay awake for. I’m more inclined to eat cereal for dinner and dinner in the morning. LOL! You’re Brie & tomato pasta is now a staple in our household. I never thanked you and only thought of it when you mentioned it. Thank you for one of my very, very favorite recipes. I’d have to agree. I could live on that and eggs and bacon (preferably fried eggs). I finally made this after pinning it ages ago. Delicious! The gravy was simple but lovely. Two thumbs up!